My friend Chris and blogger of "Everyday Riding" has just made the announcement of his trip for this summer. Chris did a great trip in 2011, a loop around the east coast with a night spent at my house. I blogged the day trip we took together, you can read it here and his blog here. For 2012, he is planning a 7 week trip from Minneapolis to San Diego by way of Fairbanks, Alaska. He's spending 50 days on the road, it's going to be a great trip. It's time for me to divulge my summer plans for this year, something I have been planning for a long time and the reason I bought my Yamaha Super Ténéré. I still don't have a job but just like him I plan on selling my Kawasaki Concours to fund this trip. I can't hold it any longer, I'm not getting younger and every day going by is a lost opportunity. I have made up my mind and have started making plans for my trip to Alaska and all the way to the top of the continent, to the town of Deadhorse, also known as Prudhoe Bay. During my planning stages and while browsing through the Yamaha Super Ténéré forum I find out a group of guys are putting together the First North American Super Ténéré Gathering being held in Whitehorse, Yukon Canada from July 1st through the 5th. The plan is to be there to celebrate Canada's day, July 1st and US day, July 4th. This event just happens to be in my time frame and in the direction I was planning to ride. With my head in overdrive, now that I know that 40 other Ténéré riders are either confirmed or planning to attend, I started making my plans and selecting my route. 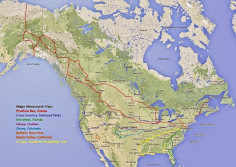 The route is still in the planning stages but I plan on crossing into Canada at Niagara Falls and then continue along the north side of Lake Huron crossing back into the US in Sault Ste. Marie, continue through Michigan, Wisconsin, Minnesota and then cross back into Canada in North Dakota. I will continue to Dawson Creek, British Columbia to get to the start of the Alaska Highway, the road I will take all the way to Alaska with a stop in Whitehorse, Yukon for the Ténéré gathering. After the event I will continue north through Fairbanks and then all the way as far north as one can go to Deadhorse, Alaska. Here's my planned route up to Alaska, a little over 5000 miles. On the way back I plan on stopping by Juneau, Alaska, then make my way to Prince George, British Columbia and then visit the two parks I have been dreaming of visiting for a long time, Jasper and Banff National Parks in Alberta. I will cross back into the US in Montana and head to Columbia Falls and then cross Glacier National Park and stop in Shelby. 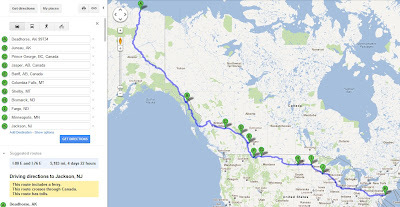 I missed Glacier NP on my cross country trip in 2010, not enough time then, but this time I'm putting it into my route. Next I will head east with stops in Bismark, then Fargo and finally Minneapolis. After Minneapolis I will continue straight home. Here's my planned route back home, almost 5200 miles. I know it's a long trip, it's going to be difficult riding my Ténéré with the current seat, I might have to buy a new seat or just tough it out. I will need knobbies when I get to Alaska and will have to change the oil a couple of times but it's going to be worth it. There are so many places I would like to go by, it's impossible to see everything, if anyone has any suggestions, feel free to comment. I think you are going to have your plate full with some wonderful places to visit. You are going west aren't you? how about really going west? Looks Good George! Can't wait to see you taking off. Fantastic George, I will be following you along the way. Just brilliant. Good on you. That trip is going to be an epic undertaking and I think you are going to have so much fun. I don't know to much about what to see along your route, but I know from experience you won't be disappointed with Banff and Jasper. They are stunning. Brunch at the Banff Springs Hotel used to be quite the thing too. We've partaken of it once or twice back in the day. Can't really offer any suggestions other than to have as much fun as you can, keep us updated (lots of pics) and stay safe! Wow George, that is a cracking trip you are planning! You didn’t say how long your trip will be and I can only imagine this will take quite some time. Are you making the journey on your own, or with others? I see you are planning to meet up with other Ténéré riders in Canada, but what about the journey to get there?. I could offer some advice about some parts of your trip and will do so in due course, but the best advice I can give is DO IT! As you quite rightly say, none of us are getting any younger and the chance of being able to make a trip like this is rare and challenging, so if you can, you definitely should go. It’s just fantastic you are doing this George! A journey like this will change your outlook on a few things. It will give you a tremendous sense of adventure and freedom. You will see things that you have only ever dreamed about. There will be things to overcome and great people to meet. I am so pleased for you. Nice, very nice! I look forward to hearing about your planning and of course the trip itself. Take pictures. Lots and lots of pictures and share them with your family, friends and the occasional blog reader! At least a month and a half but probably more. I would love for my wife and daughter to fly to Calgary so we could rent a car for a week and visit Jasper and Banff. I will probably plan a week to get to Whitehorse, spend the 5 days there for the gathering, then a week to get to Deadhorse. Probably 2 or 3 weeks to get back. Still have to plan the mileage and stops. George, that looks like a great trip. If your crossing northern WI on US-2, I'd be happy to ride up to Ashland, 40 minutes away, and ride with you to Duluth. Or I can offer to help you out with what ever you might need when you're up this way. Yea, I will be riding US-2, it's on the route I'm planning. That would be great, we could meet up there. We will keep in touch. you are going on a trip of a lifetime, but you are missing all the best motorcycle roads in British Columbia and instead taking the nondescript route through the prairies. Not unless you are planning to visit Dinosaur NP, Buffalo Jump and Milk River. if you wish to take your S10 off road you should consider the ferry from Prince Rupert to Bella Coola, then take hwy20 to Williams Lake. I can steer you towards some gravel roads through lots of First Nations (Indian) villages. The Gang Ranch is the largest ranch in BC by area. You will be in cowboy country, the Chilcotin. Send me the names of the roads or point A to point B so I can look it up on Google Maps. If you are planning on being in Whitehorse in the beginning of July, I may be able to run into you. I plan on leaving Fairbanks on the July 4th weekend to head south and would be in Whitehorse in two days. I probably won't be going through Dawson City and the Top of the World Hwy. It sounds like a great trip but definitely not "once in a lifetime". You need to take these kind of trips every year now that you have the Ténéré. As far as knobbies, you could contact Adventure Cycleworks in Fairbanks. I believe that you can pre-order tires through them or ship them up yourself and and have them switch them when you get there. And they routinely store gear for those heading north looking to lighten their loads. It sure beats carrying tires yourself. Another thing to look into is housing at the University. Relatively cheap and very popular among the ADVrider crowd. I will most likely leave on the 5th since the gathering ends on the 5th and everyone will be heading out. I will be shipping tires to the Yamaha dealer in Whitehorse. I will look into the university housing. Where's the university? The university with cheap housing is in Fairbanks. I can write more after work, from home, but here are some thoughts to ponder. I notice you are returning via: Hyder to Kitwanga via Hwy 37. I have been to New Aiyansh and it is paved from there south to Terrace. It is a great road, built for adv bikes like the S10 or Vstrom, paved but a bit rough. You go through Lava fields in the Nass Valley. There is a dirt/gravel road which intersecs half way down Hwy 37. Lava Lake is 22 miles long and created by a Bursting Volcano only 400 years ago. It buried the valley in around 50 ft of lava, so it is now all sacred ground. If you get to New Aiyansh make sure you ride north about 3 miles to the old suspension bridge at Canyon City. if you decided to take the ferry you will have more off road options. These are mainly gravel roads through indian land. Go West from Terrace to Prince Rupert. Make sure you go to the Cannery at Port Edward. Take the ferry to Bella Coola and take Hwy 20 towards Williams Lake. You will go over "THE HILL"
Sounds like a wonderful trip. Listen to uncle Bob, he knows the area like the back of his hand. I'm looking forward to the pictures I will take and the beauty of Canada and Alaska. I have been dreaming of Alaska for awhile...like a lot of people...so I'm totally jealous. Maybe I'll start planning....you have motivated me!!! Good Luck and let us know which route you choose!! Awesome trip George! Thanks for the shoutout too! You are welcome anytime in Minneapolis. I hope our paths will cross on your return trip. It'd be great to catch up.